I recently got a chance to try out an awesome hair accessory inspired by hairstylists from the Caribbean Islands called Twirlyz. They are great for styling any type of hair and can have you styled and ready to go in seconds. One of the best things about Twirlyz is that they are waterproof, reusable and non-toxic as per the company. 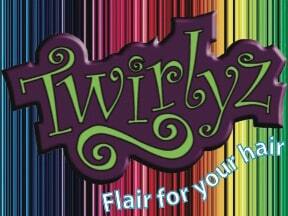 With every color of the rainbow available and charms that can attach to them as well, there is sure to be a Twirlyz for any taste and outfit. They are also available in two sizes; 5 inch and 9 inch to accommodate different lengths of hair. 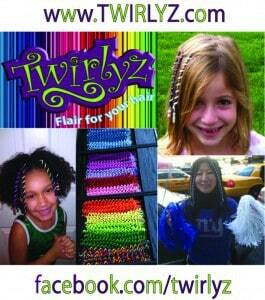 From dance, gymnastics school teams and just showing your own colors, there are a ton of great uses for Twirlyz. They are easy to use and literally only take seconds to get into your hair. We love Twirlyz in our house. They are a definite eye catcher when our little one is out and about wearing them. 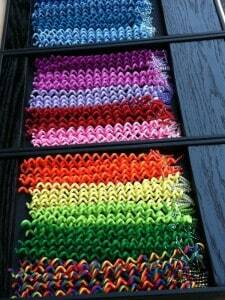 Twirlyz is a product that I would definitely recommend for those that love hair accessories. We really love them. Courtesy of Twirlyz, one lucky MomMomOnTheGo fan is going to win a $25 credit to spend on the Twirlyz website. This contest is open to residents of Canada and the USA who are over the age of 18 and where permitted by local laws to enter. Please ensure that you familiarize yourself with your local laws on entering and winning contests. MomMomOnTheGo Fans also get a special coupon code for their purchases. Disclosure: Twirlyz provided MomMomOnTheGo samples of their products in order to test them and write this review. As always our opinion are our own and our honest opinion. any of the spring time charms would be lovely! The flowers or the hearts! Probably the pink or the rainbow! My daughter would love the pink ones!!!! My favorite color is the Plum, Peppermint white. or else just purple. The Butterfly and sun are both so nice!! I love the flower charms especially the white daisy with yellow centre (my wedding flowers). Pink anything, the raspberry sounds yummy! would love the rainbow ones for the granddaughters! So cute! I would like the charm form the Spring ones it is the ladybug. I love the red white and blue ones!! I would get a peace sign charm. I would like the dog charms. I would like to try the Pacific Blue color. My daughter would love the rainbow one!! christmas jingle bells. they are cute.